It's our birthday! And we baked a cake to share! The Introducing Lesbian Fiction 2012 Event is a guest posting week to celebrate the first anniversary of Good Lesbian Books. We asked for people to send us their recommendations for a book for a first time lesbian reader. To the contributors: if there is anything you want changed, from the name or username you are credited under to details in your post, please let us know! 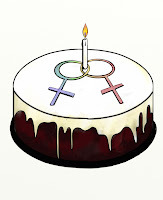 Read the opening post: Introducing Lesbian Fiction: Happy Birthday to Us! Cat from Good Lesbian Books: Too many to list! Introducing Lesbian Fiction: Have Your Say! Which lesbian book should you read first? Leave us a comment here!